Big Thunder Mountain Railroad is a different ride at night. A combination of the nighttime look and cooler temperatures give the ride a different feeling in comparison to riding on the attraction during the daytime. At night, Big Thunder Mountain Railroad is darker; however, there are still lights on during the ride so it is not that dark, especially when compared to Space Mountain. Most of the track for Big Thunder Mountain Railroad is outside, so there is a difference at night. 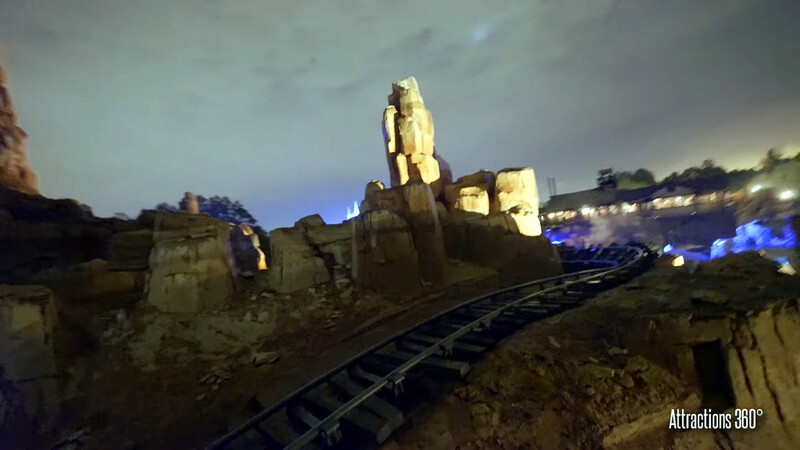 Above photo of Big Thunder Mountain Railroad at night by SoCal Attractions 360. Photo is a screen capture from their video that is featured below. Used under the fair-use provision. Cooler Temperatures during the nighttime also change the ride experience for Big Thunder Mountain Railroad. The cooler temperatures are more noticeable during the winter and early spring seasons in Florida. During those seasons, the difference between daytime and nighttime temperatures are larger when compared to the summer and early fall seasons. Colder temperatures are more noticeable on Big Thunder Mountain Railroad, in comparison to other rides in the Magic Kingdom. With the attraction being mostly outside and the fast speed at which the train travels makes the air temperature noticeable. The cool air at night is something to take into consideration when riding Big Thunder Mountain Railroad at night. The good thing about being in Florida is that the temperatures don’t get too cold that often, so it won’t be like going to Lake Tahoe or Glacier National Park in the winter. Our team has selected some of the following videos on YouTube that showcase the attraction at night. These are some of the best videos we have found and they will help to give an idea of what the ride is like, except for the cool temperatures in the winter, unless it is winter or you are near an air conditioning vent. In addition to the information contained on this page, you can learn more about the roller coaster by visiting the other pages that are featured on the site.